Semicurado de Barros / There are 3 products. 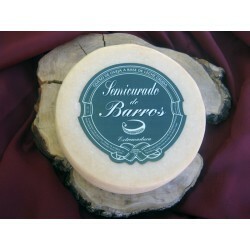 Barros curds, hard paste cured cheese made from raw sheep's milk .. From intense flavor and well structured in the mouth. Its slightly spicy flavor is accentuated with the passage of time. They have a minimum maturity of three months, after which vacuum packed and go on sale in formats .It has 440 grams, 840 grams and 1500 grams.